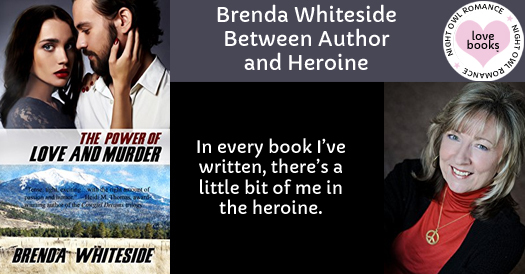 In every book I’ve written, there’s a little bit of me in the heroine. On the other hand, my characters take on a life of their own once I put my fingers to the keyboard. In The Power of Love and Murder, Penny Sparks has experienced much more trauma and heartache than I have. She lives in one of my favorite Arizona cities—Flagstaff. I thought it would be fun to compare our favorite things about the college, mountain town that sits at an elevation of 6,910 feet. Which is your favorite season in Flagstaff? Brenda: I love the snowy winter. Penny: I much prefer spring. Winter equates to Christmas and since I lost my family one Christmas thirteen years ago, I dread the winter. Although, this season I met Jake, so I might have to rethink that. Where is your favorite place to eat in the area? Brenda: There’s a Mexican food restaurant as you head out of town on Route 66 I enjoy. Penny: Oh, yes, Mexican food, but I prefer the Kachina Café downtown. It’s cozy and has a patio out back. What is your favorite thing to do in town? Brenda: Flagstaff is a college town, and because of that I find the shops unique and fun. You can walk the narrow streets and encounter small eclectic shops as well as a haunted hotel. Penny: And I work in that hotel. I won’t comment on the truth of that haunted reputation. I prefer to drive out of town and go up the mountain to the ski resort area. It’s beautiful up there any season. The food is good, too. What is your favorite site in the town? Brenda: Route 66 passes through town and next to it is the train track. The train station has been remodeled. The sound of the train rolling through and the whistle reminds me of nights in my dorm room in college. Penny: I have to agree with Brenda on this one. I love the sound of a train whistle. What is your favorite site in the area around Flagstaff? Brenda: The San Francisco Peaks are visible from everywhere. The highest point is Humphrey’s Peak at an elevation of 12,633 feet. It’s spectacular. Penny: Although I haven’t been a fan of winter, the Peaks are every bit as beautiful as Brenda thinks, especially in winter. Brenda and her husband are gypsies at heart having lived in six states and two countries. Currently, they split their time between the prairie in Northern Arizona and the RV life. At home or in the RV, she spends most of her time writing stories of discovery and love entangled with suspense.